"Matt Booth is back in business—the cigar business that is. The Los Angeles jeweler-turned-cigarmaker known for his Room101 brand of cigars and avant-garde rings and bracelets has told Cigar Aficionado he is returning to the world of tobacco. Though he officially bid farewell to the industry earlier this year, Booth just couldn't stay away. Soon after his supposed retirement in January, he quietly turned to Robert Caldwell of Caldwell Cigar Co. and prolific Nicaraguan cigar manufacturer A.J. Fernandez. The trio created two new brands that will be introduced next week at the IPCPR trade show—Hit & Run and The Truth. "It was great to work with friends and create a new product with them," Booth told Cigar Aficionado. "This was meant to be a true collaboration and a reinvention of myself. I stepped away from the business and now that I'm back, am able to participate more in the creative process. I find myself excited about tobacco in the same way I was when I first started in the industry." Made at the William Ventura factory in the Dominican Republic, the Hit & Run brand was put together by Booth and Caldwell. It's a mélange of Ecuadoran Habano wrapper, Indonesian binder and Dominican filler. Hit & Run will come packaged in 10-count boxes and offered in five sizes: 46x6, 54x6, 52x4 3/4, 50x6 (piramide) and 60x5 1/8 (perfecto). "I think the boutique segment has changed," Booth said. "Caldwell is the next step in alternatively stylized product, as well as market disruption." The Truth is a three-way collaboration between Booth, Caldwell and A.J. Fernandez. It's made in five box-pressed sizes: Short Churchill, measuring 5 1/2 inches by 48 ring gauge; Robusto, 5 by 52; Toro Grande, 6 1/2 by 56; Toro, 5 by 52; and Lonsdale, 6 1/2 by 44. These come in boxes of 20, save for the Short Churchill, which is packed in a box of 10. Fernandez makes The Truth at his factory in Nicaragua using only Nicaraguan tobacco. Both Hit & Run and The Truth are slated to retail for $10 to $13. "Matt has been a friend of mine since before I was in the business as a manufacturer," Caldwell told Cigar Aficionado. "He approached me to do something light and fun together and we came up with these collabs. I am also very excited to be able to finally work together with A.J. His attention to detail on the farm and factory level is second to none." Hit & Run will come packaged in 10-count boxes and offered in five sizes: 46x6, 54x6, 52x43/4, 50x6 (piramide) and 60x51/8 (perfecto). 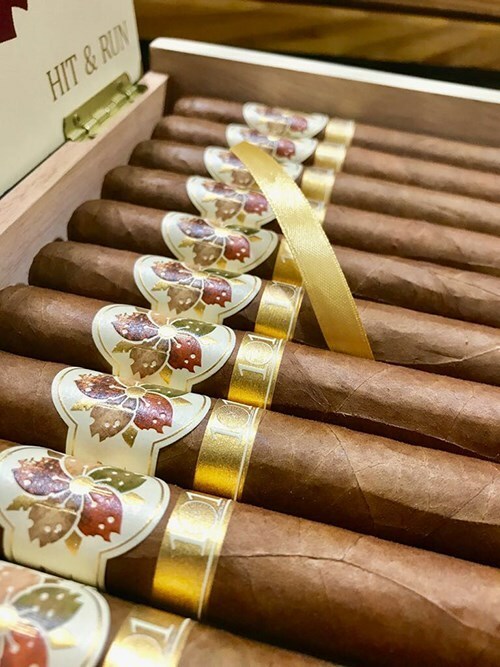 Booth plans on producing only 100,00 cigars from each brand (200,000 total) and is uncertain as to whether they will be produced in limited quantities afterward or if these are true one-and-done, limited-edition cigars. "We'll see what the future brings," he said. "For now, this is what it is." Booth first came onto the cigar scene in 2009 with his Room101 brand. He made his name in the cigar industry by packaging his Honduran cigars in unorthodox boxes designed with Japanese-inspired motifs that complemented his cutting-edge jewelry. Booth contracted Camacho Cigars to produce the inaugural batch of Room101 smokes, but when Davidoff of Geneva acquired Camacho cigars, it picked up distribution of the Room101 cigar brand in the process. Earlier this year Booth and Davidoff parted ways, ending their distribution agreement. Although the Room101 Cigar Co. still exists, these new brands will not bear the Room101 name. Booth hinted that there might be some cigars in the future under the Room101 name, but would not comment any further. Though a few retailers already have Hit & Run, the cigars will be shipping to retailers across the country by the end of next week. The Truth will be shipping in September."